Professor David Munro on our Quest just above the St Conal well. One of the interesting things about being an outsider in a place is not having a sense of the history of an area. I’m from the eastern United States, and, despite having lived in Dumfries for three years, still have not explored huge swathes of the region. In particular, I had never been to Kirkconnel, nor did I know anything about its namesake, the kirk (church) of St Conal. 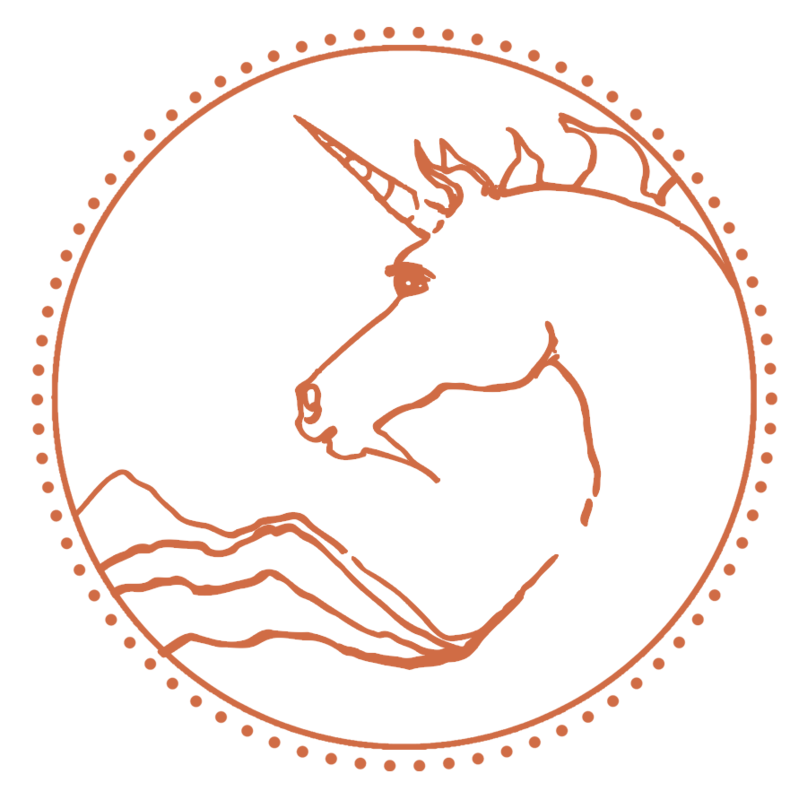 During my masters degree at the University of Glasgow, I published a paper on the role of the palimpsest in understanding ecological landscapes (http://philpapers.org/rec/LAYTTE). In literal terms, a palimpsest is a parchment in which the original writing was scraped off, the parchment reused, and then, after some time, the original writing becomes visible as another layer underneath the second (or even third) text, usually as a result of the oxidation of iron in the original ink. When used as a metaphor of understanding the world around us, a palimpsest is a way of describing the past visible in the present. 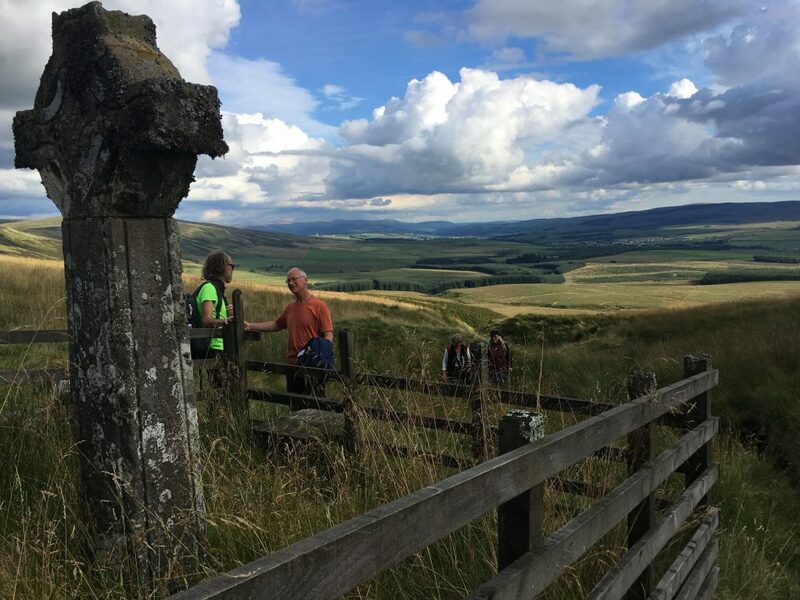 The quest through St Conal’s landscape proved to be a palimpsest in many ways, with Professor of Geography David Munro, the geographer in residence of Drumlanrig Castle, proving to be the catalyst for revealing the history at our fingertips. Professor David Munro talking about the places names as we embark on our Quest. We began by talking about place names, one of the best ways to get a sense of the landscape and its uses over time. 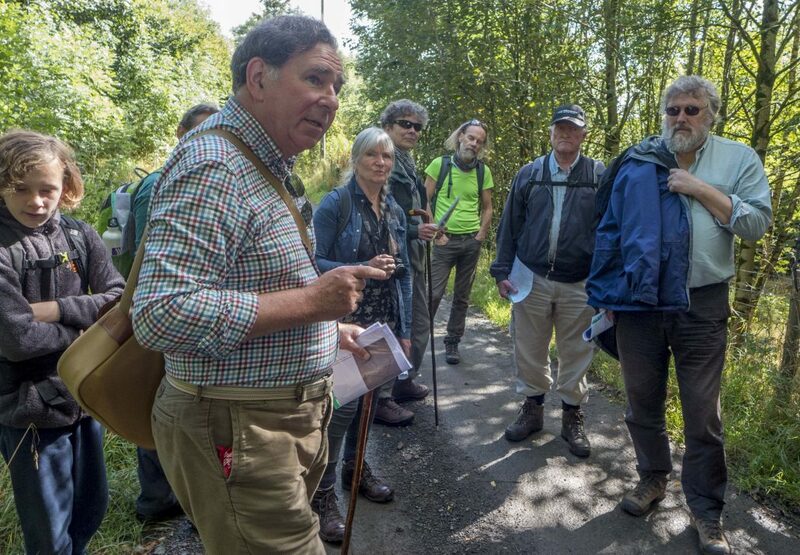 Professor Munro’s work with old maps on the Buccleuch Estate was a fascinating addition to experiencing the landscape. 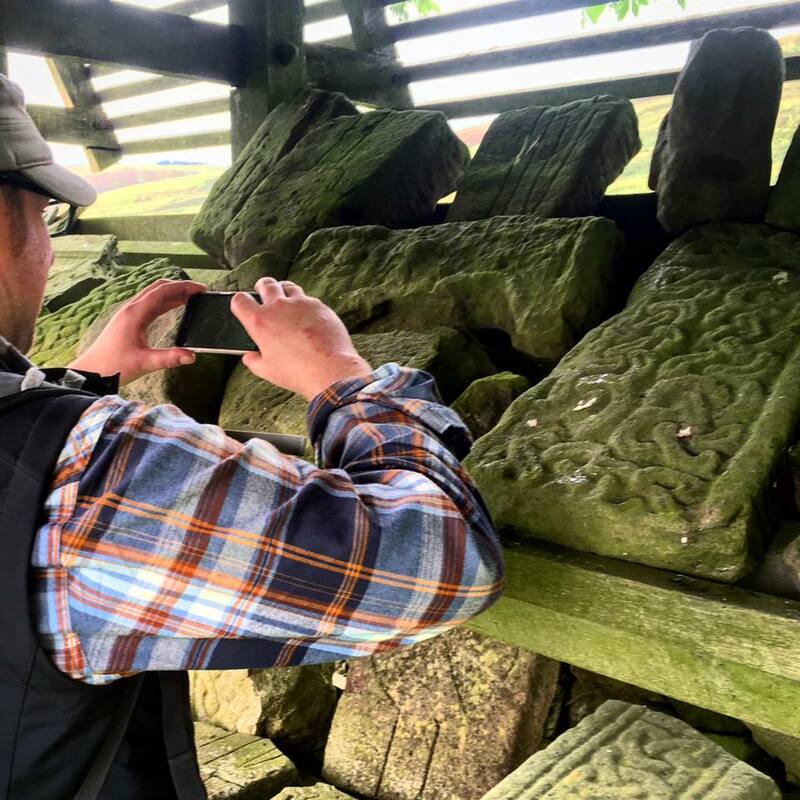 Dr David Borthwick, eco poet, capturing the centric stones collected from the old Kirk yard. The location of St Conal’s church is up in the hills, a good walk from the town. When you’re standing at the site, it is very secluded, with only a few farms and wind turbines visible. It wouldn’t have always been this secluded, however. 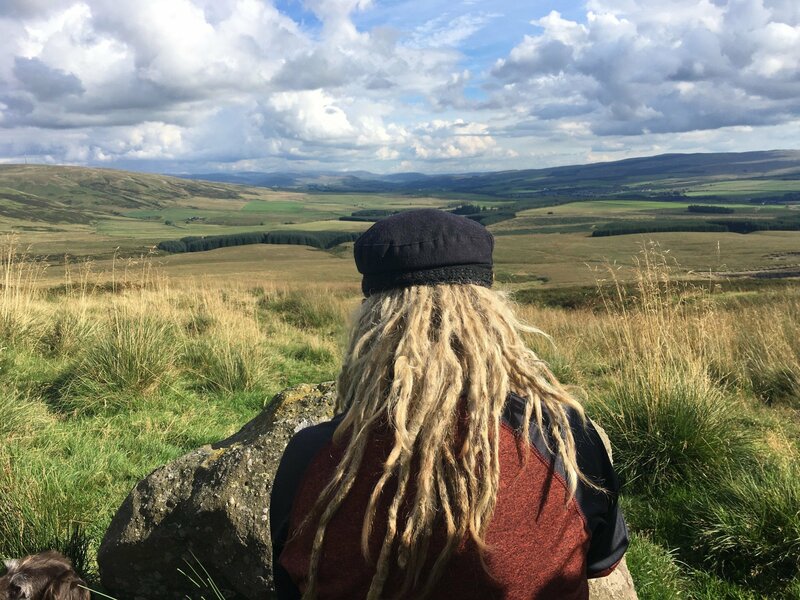 Professor Munro pointed out that the location was at a central crossroads for the droving paths which predated, by hundreds of years, the A-roads and train lines of the region. The church was moved as those new roads were built, and the one we visited, the original, fell into ruin. 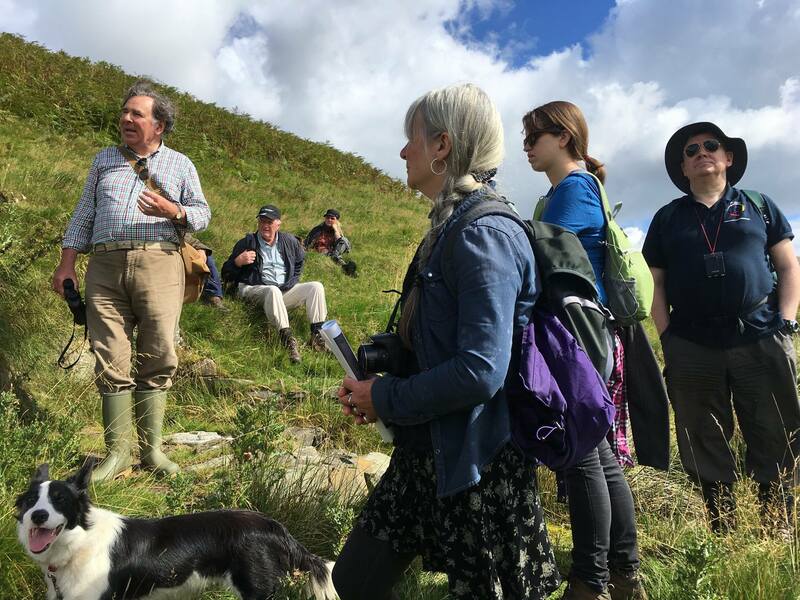 Impromptu dowsing with William Hogarth, a retired farmer who used to dowse for broken drains guided by Grahame Gardiner and Sheila Pollock at St Conal’s kirk. These archaeological remains are of course the most obvious landscape palimpsest of the quest. St Conal’s church dates back well over a millennium to the sixth century (one of Scotland’s oldest church sites!). Standing in the remains of the church was a very powerful experience – in more ways than one. Many members of our party were enthusiastic practitioners of ‘dowsing’, and other traditional arts that people have been doing for centuries. Watching the group get excited over the energy lines running through St Conal’s church brought a different sort of spirituality to the place, and layered the spiritual significance of the site. It also illustrated the differing ways of engaging with the landscape that different members of our group had. The relatively recent carving thats marks the location of St Conal’s well. 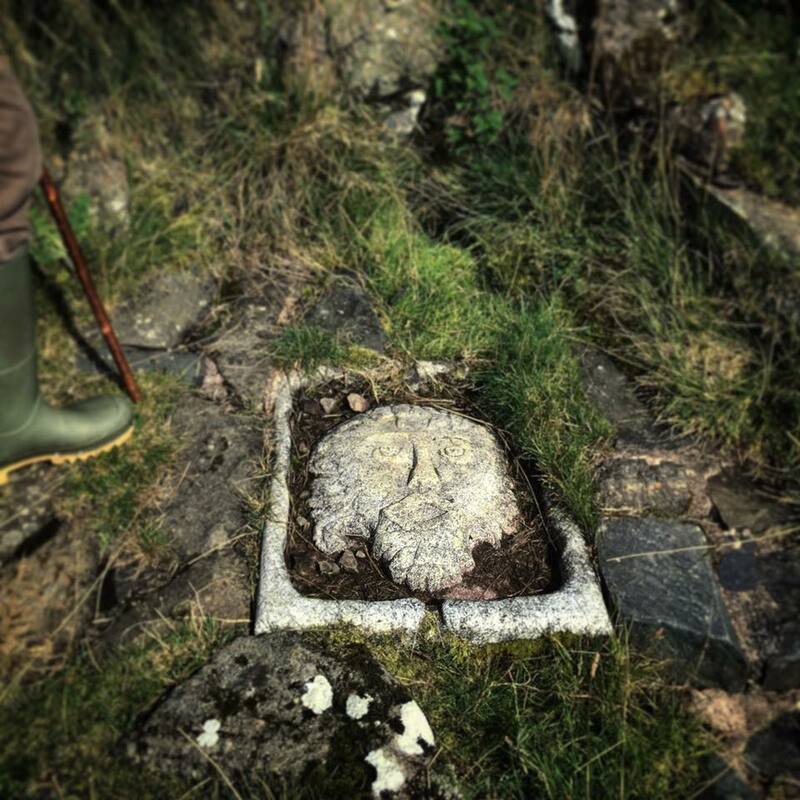 For me, the most powerful part of the quest was not the site of the church at all, but rather a small carved stone a quarter mile away – the marker for St Conal’s well. The well was at the base of the hills where St Conal met St Mungo. Being in the landscape to hear that story made it much more powerful than just reading about it, and added a deep significance to the site. Even more powerful was the carved stone marker at the well itself – and the realisation that the well was still active and flowing despite the irrigation and agricultural changes to the region over time. One of our canine group members, Jess, illustrated the well’s activity perfectly by diving headfirst into it, basking in the water within (and helpfully clearing away a lot of the overgrowth hiding the spring itself). I didn’t have time to join the intrepid explorers of our group who carried on up to the cross and grave of St Conal, and so returned with the less adventurous group to the caravan back. Hopefully another blogger will pick up where I’ve left off, and continue the description of the experience. 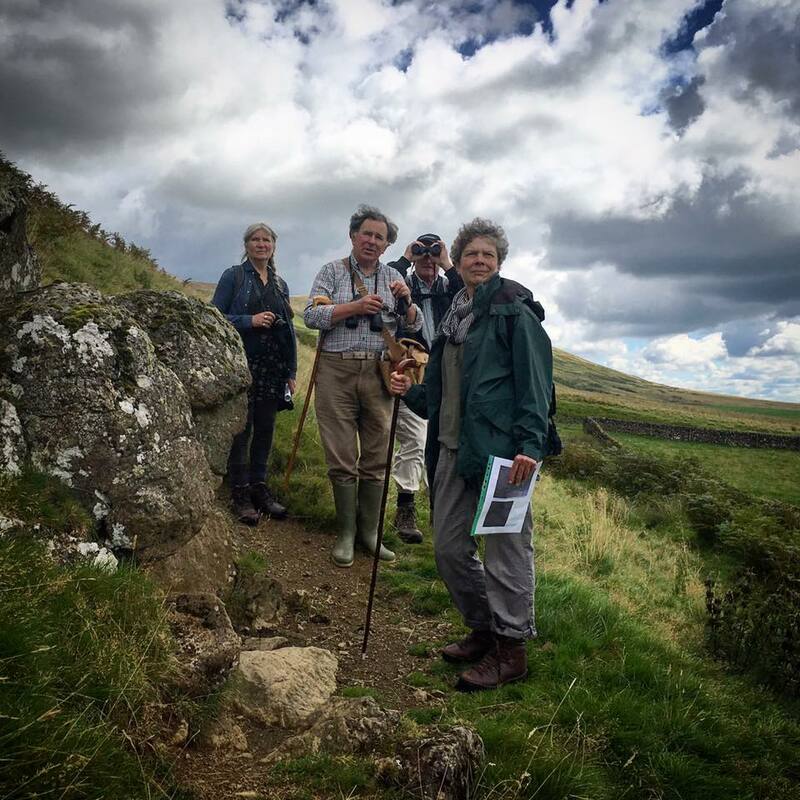 All in all, the quest, like the other I’ve been on, was a way to engage with the landscape through someone else’s knowledge and interests, adding layers of significance of past and present onto the natural environment. High on the Halfmerk Hill, beyond the bracken, before the forest, the Cross of St Conal can just be glimpsed from the Kirk; somewhere close is the stone. Legend claims Conal is buried there. The map tells us it’s a little over a mile to the cross from the old church of St Conal, with about 500 feet of ascent. We start this journey as a gentle stroll through sheep pasture; after negotiating a rickety barbed wire fence, we ford Glenwharrie Burn and follow a quad bike track, but not for long. We set up on to the open hill, trackless, full of tussocks and streams hidden with summer growth. Our spirits are lifted by the weather; the day is full of kind late-summer sunshine mixed with a September sky of soft cloud. The westering light brings out the colours, the greens of the pasture and the just-purple of the heather. The cross, old Celtic style, is easy to find. This was placed here in 1880 to commemorate St Conal, but we are searching for the stone, further back in time. We separate to search. Graeme dowses, finding a direction to seek. Yes, along his line, lies the stone, screened by tussock, quietly waiting. But Debz had reached the stone first, directed by her intuition. A block, sort of box-like, encrusted with quartz inclusions. There’s a smaller partner, positioned as if for kneeling, as if the stone is the altar. 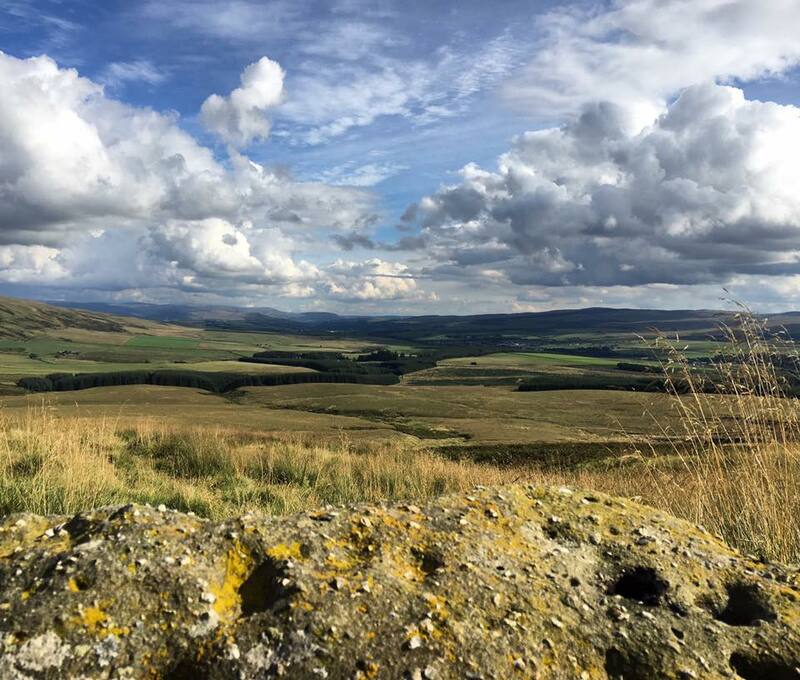 The stone faces to Nithsdale, we have this panorama and the sense of a panoptic view. 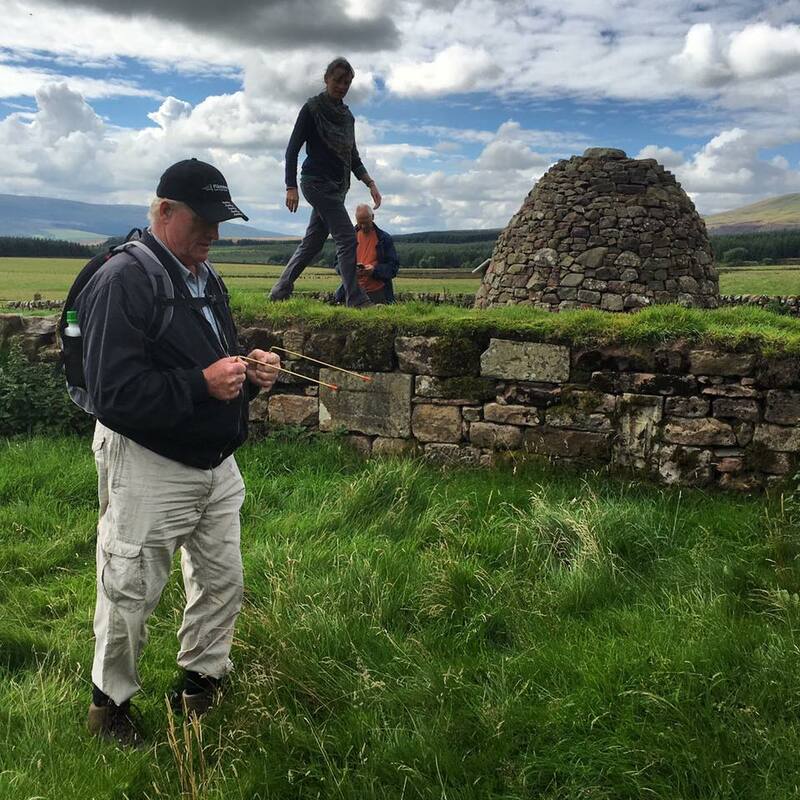 Graham takes a bearing with his sighting compass: the stone is aligned towards the horizon where the sun rises at winter solstice. There’s more: the stone has circular markings, perhaps carved. Sheila has brought water with flower essence; this can help with fear. Debz anoints the stone, Michael too and then Jan. Graham tells us the shallower ones may be sunrise markers; the deeper one may be to receive a staff or rod. Astronomical stone? Burial stone? Devotional stone? History is silent, but the land speaks quietly to us. The cup marks on the druid stone which may symbolise the stars. As we headed down the hill we found another stone aligned with the St Conals Kirk, was this where St Conal was buried? the Quest goes on…. 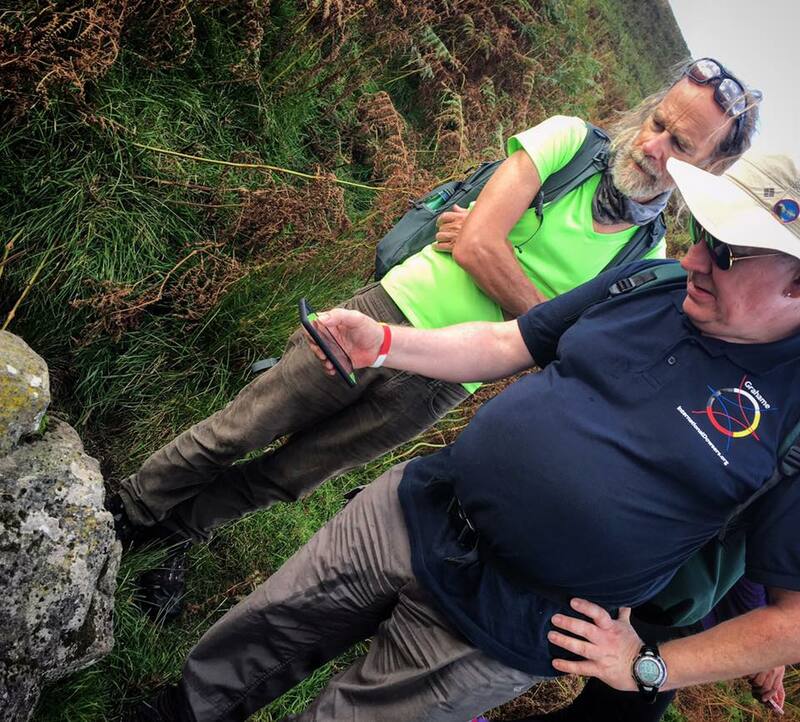 Thanks to David Ball for the account of Stage 2 of our Quest. David Ball has retired as an anaesthetist, but continues with charity work and teaching in Africa. “But now I can walk, run and cycle more. Or just sit. So I’m listening to what the landscape is telling me”. Curated and guided by Dr Jan Hogarth with knowledge and insight from Professor David Munro. Big thanks to Grahame Gardiner and Sheila Pollock for sharing their healing knowledge and excellent dowsing skills. Thanks to everyone for participating, sharing ideas and insights and making the day so interesting and so much fun.